French Super Cup football betting tips, predictions and previews - Winning picks and selections from French Super Cup football experts. The French Super Cup (Trophée des Champions) is an annual football match in France between the champions of Ligue 1 and the winners of the Coupe de France. The match is organised by the Ligue de Football Professionnel (LFP) and the Union Syndicale des Journalistes Sportifs de France (UJSF). The French Super Cup began as an unofficial match in 1949 when the first division champions Reims defeated the Coupe de France winners Racing Paris 4–3 at the Stade Olympique Yves-du-Manoir in Colombes. The contest resurfaced in 1955 as the Challenge des champions which was organised by the French Football Federation (FFF). The Challenge des champions remained until 1973 when Lyon beat Nantes 2-0 at the Stade de l'Armoricaine in Brest. The match went on hiatus but returned in 1985 with Monaco defeating Bordeaux in a penalty shootout at Parc Lescure in Bordeaux. In 1986 Bordeaux defeated Paris Saint-Germain 1-0 at the Stade Guadeloupe but the Challenge des champions was abolished because a lack of interest. The FFF brought the competitions back in 1995 and called it the Trophée des champions. Paris Saint-Germain defeated Nantes at the Stade Francis-Le Blé in Brest to claim the trophy but the 1996 French Super Cup was not played because Auxerre won the league and cup double. The competition was close to being cancelled again in 2008 when Lyon won the Ligue 1 and French Cup double. The rules were changed to allow the Ligue 1 runners-up Bordeaux to face Lyon with Bordeaux winning the match 5–4 on penalties after 0-0 draw at the Stade Chaban-Delmas in Bordeaux. The French Super Cup was held at a stadium in France until 2008 but has been played outside France since 2009 when Bordeaux defeated Guingamp 2-0 at the Stade Olympique in Montreal, Canada. It has since been held in Tunisia, Morocco, USA, Gabon, China and Austria. The Ligue de Football Professionnel (LFP) announced that the match would take place in China in 2018 and 2019 with another match to take place in China between 2020 and 2023. 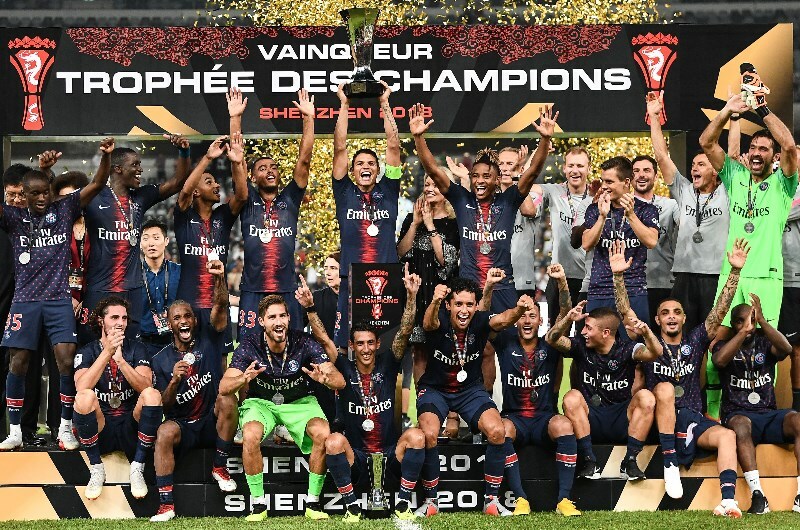 Paris Saint-Germain are the defending champions after winning the 2018 Trophée des Champions with a 4-0 win against Monaco at China Shenzhen Universiade Sports Centre in Shenzhen, China. The 2019 Trophée des Champions will also be held in Shenzhen, China with the date to be determined. Paris Saint-Germain and Lyon have both won eight French Super Cups wit PSG winning the last six competitions between 2013 and 2018. Saint-Etienne have won five titles with Monaco and Reims both winning the Trophée des Champions on four occasions. Nantes, Bordeaux and Marseille have all won three times with five clubs all winning once; Nice, Sedan, Rennes, Le Havre and Bastia.